Managers can also import timesheets in bulk for staff by importing an Excel sheet. The options are under the Time Clock tab > Upload TimeSheets. 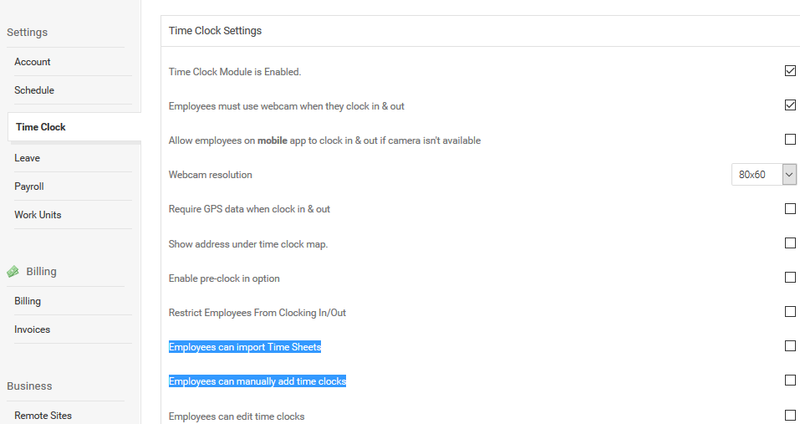 Or enable the same feature for your staff so they can import multiple clock times at once. ShiftPlanning allows time-sheets to be uploaded in both .xls and .CSV format. Please make sure that the spelling for the 'Name' and 'Schedule' are matched exactly in the system otherwise they will not save. Please see the following format for the exact way to structure including the exact column names and order. Imported time-sheets will automatically be sent to you for approval before they are added into the staff's confirmed work-time. To upload an overnight time sheet, make sure you add the additional column for 'end date'.